Expanse of Acropora millepora on the Great Barrier Reef: Can humans help corals accelerate the development of their own defenses against environmental threats? Image: AIMS. In a race with the accelerating warming and acidification of the seas, marine biologists are attempting to put stony corals on a fast track to becoming more tolerant of water conditions that might previously have triggered their bleaching or demise. Dr. Madeleine van Oppen at the Australian Institute of Marine Science. In a video entitled How to Train Your Coral, published on her Gates Lab site in Hawaii, Dr. Gates explains in the most basic terms that stony coral fragments in experimental tanks can be induced to become ever better at self defense against environmental insults. Repeated episodes of elevated temperature, for example, can make some corals better able to handle a more serious warming event. “The environment signals the genes in the corals, and we know that there are genetic expressions of defensive reactions, and these can be measured in the metabolites produced by the coral.” Once these defense mechanisms are “turned on,” she says, the hope is that the corals can be returned to the wild to help improve the future genetic resilience of entire reef areas. Experiments will be done in land-based closed systems, including Australia’s state-of-the art National Sea Simulator at Cairns. “We plan to evaluate the effectiveness and feasibility of four different AE approaches to enhance the environmental stress tolerance of reef-building corals. (See below.) Over the past several years we have already done some pilot work in AE, however, our research is in the early stages,” Dr. van Oppen explained. The AE in coral concept was ‘spawned’ by decades of work by the two teams unraveling the mechanisms of adaptation and acclimatisation in corals, as well as a number of observations across the Indo-Pacific by other researchers who have found that some corals have naturally adapted or acclimatised to areas with elevated temperature. 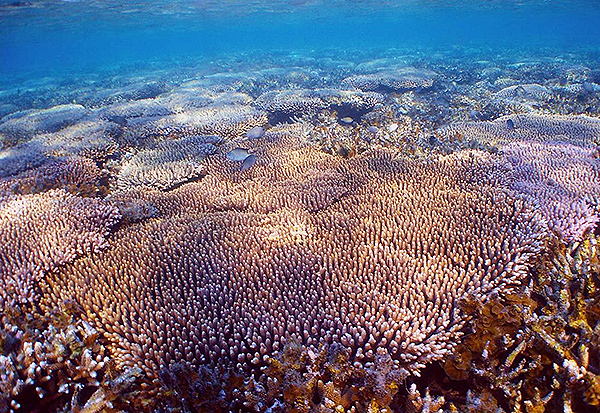 It is now known that some corals have become more tolerant to bleaching over successive bleaching events. Contrary to popular belief, it may not take thousands of years for stony corals to find ways to survive potentially lethal environmental stresses. “This is important as the economic value of coral reefs through commercial and recreational fisheries, tourism, drug discovery, and coastal protection is immense,” Dr. Gates added. 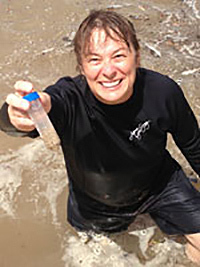 Dr. Ruth Gates at the Hawaii Institute of Marine Biology. Van Oppen explained that the promotion of new resilient forms of coral raises important questions regarding the desirability of introducing these corals into the reef areas. In step with the development of AE techniques in corals over the next 5-10 years, van Oppen hopes there will be an open discussion with relevant scientific bodies, policy makers, coral reef managers and the general public on how these new options for enhancing reef resilience should be used. “This will require careful ecological risk assessment together with a consideration of the ethical and socioeconomic implications,” concluded Dr. van Oppen. In response to questions about the AE projects and possible research into the use of controversial transgenic or GM techniques, Dr. van Oppen has published an interview on the AIMS web site (see below). An interview with AIMS scientist Dr Madeleine van Oppen about her ongoing research into “Assisted Evolution” in corals. Assisted Evolution (AE) is sometimes called “human-assisted evolution” because it involves human intervention to accelerate the rate of naturally occurring evolutionary processes. The purpose of AE is to change certain characteristics of an organism, in our case the coral’s resistance to environmental stress such as elevated temperature and ocean acidification. 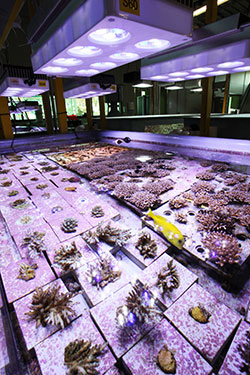 Right now, scientists at AIMS are working on AE in a number of coral species. In AE we do not actively insert the genes from one species into another. 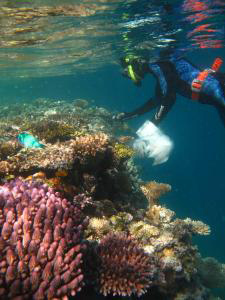 Dr. van Oppen collecting coral fragments from an Australian reef. 4] The pre-conditioning of corals to elevated environmental conditions with the aim to induce epigenetically* controlled stress tolerance that is passed on to the next generation. So is AE the same as Genetic Modification? No. As far as we know no one is yet attempting to create genetically modified corals for the purpose of coral reef conservation and restoration. Genetically modified organisms (GMOs) or genetically engineered (GE) organisms are organisms whose phenotypes have been altered by the insertion of foreign genetic material. Foreign genetic material is defined as genetic material that stems from another species. So AE is a natural process? Yes, in contrast to GM, AE is a natural process. It is encouraging evolution faster than usual. While the exchange of genes between unrelated species does occur occasionally in nature (e.g., between bacteria and mediated by viruses; from microbial endosymbionts to the host organism), the active insertion of genes from one species into another is not part of AE as we propose it. Some people say it is like playing God and have objections for ethical reasons. Others may say the ecological risks are unknown and therefore oppose the approach. Some may agree that against the backdrop of rapidly declining coral health worldwide, the development of tools to help protect corals from stress is urgent. For these exact reasons we are debating, testing, collaborating and opening up the discussion with the public, scientists, policy makers, coral reef managers and industry. *Epigenetics is the study of biological mechanisms that will switch genes on and off.